If you’re one of millions of senior golfers, you may have a hard time adjusting to the clubs designed for golfers in their prime. It is a fact that as you age, your reflexes become slower. You’re less likely to hit the sweet spot on your shots. Power transmission to the ball is harder because you’re swinging slower. Overall, your game is likely to be spoilt as you get older. This can lead to increasing handicaps or worse. The solution is to get yourself some clubs that are designed for use by seniors. Just like changing golf courses, your launch angle, or even the golf ball, different drivers, long irons, sand wedges, and so on can make a difference. We didn’t mess around when reviewing these senior golf sets. Our process is long, complex, and involves active play testing with all the sets. We also take the experiences of other users into account to give you the best opinion you can have. Read on for a look at the different options for golf sets for seniors and what they can do for you. Wilson is one of the premier golfing and sports gear suppliers today. We knew right off the bat that the experience we were going to have with this set would be a good one. As always, it did not disappoint. During the course of our review, we noticed many strong points about the Profile XLS. Harder, higher shots: The fairway woods are stronger and lighter. This makes swinging them a breeze to do. When shots connect (and they usually do), the lower center of gravity in the wood ensures that the maximum amount of power is transferred to the ball. Shots go clear across the fairways with these woods. Graphite/Stainless Steel shafts: Among the many perks is a lightweight graphite shaft paired with stronger stainless steel. Together, these can provide incredibly fast swing speeds, even if you’re not used to them as a senior. Easier to connect shots to the sweet spot: Aiming your swing to hit just the right place is a little more difficult as a senior using a standard club. However, if you were to use these clubs, you’d notice the difference. The head design is quite unique and promotes easier shot connection every time you swing. Special flex for seniors: The clubs come with a standard flex option, as well as a special senior flex. We tested the special one out and noticed a big difference. Vibration damping was at a maximum and it was far easier to recover after a harder shot. Versatile options: It doesn’t matter if you are a right-hander or a leftie as this set has an option for you. You can also choose between different flexes and lengths. If you’re a taller person, you will have a shot at getting these clubs anyway! Not great for power shots: While we didn’t experience this personally, users did report the woods cracking in the head when powerful shots were hit. The irons performed up to par, but the woods tended to be of a slightly lower quality. We definitely loved the Wilson XLS, but it does have small flaws. If you aren’t a power hitter and you want a set of clubs that will almost always connect your shots, these are the clubs for you. The lightweight shafts and versatile options make for a great set overall. Majek Golf may not be one of the best-known names in the industry, but the new hybrid set for seniors is a blessing. It is fun to use, has eight amazing club options, and is perfect for seniors of all heights. Better launch speeds: Each of the irons from Majek has an almost similar set of perks—you get a center of gravity that is very low. Most of the weight of the club and the head are positioned behind the actual sweet spot of the clubs. When your shots connect, you’re almost guaranteed to see your ball go flying into the distance at lightning speeds. Created by the professionals: The Majek set was designed by researchers at UCLA and was made specifically for beginners and seniors. 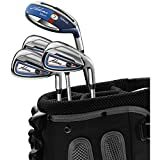 You don’t have to worry about a low-quality set of clubs in this purchase because of the high amount of research that has gone into their design. We noticed the difference between these and normal club sets almost immediately. High accuracy for shots: When reviewing these clubs, we noticed that all our shots were landing in the same general area. The shot dispersion was a lot tighter than anything we had seen before. This reason for this was revealed to us when we noticed the deep cavity back, which promoted the accuracy of each of our shots. Faster swing speeds: Among the many awesome features of this Majek set is the aerodynamic design of each of the irons. The clubs literally cut through the air when they are swung, which means that even your slower swing speeds will be made far faster when you use these clubs to make your shots. Enamel wears out fast: One of the only problems with the Majek clubs is an aesthetic one. The enamel covering on the hybrid irons tends to come off pretty fast over prolonged use. This can lead to some ugly irons over time. If you’re a senior who cares about his game over the appearance of his clubs, this is the set for you. It is designed with perfection in mind, and functionality definitely takes precedence over form. Working with these was an absolute pleasure during our review process. We would definitely recommend this to all seniors and beginner golfers out there. Adams is quite well known for its awesome clubs, whether for seniors or pros. Their technology helps golfers all over the world to improve their game. Our review of the Blue Combo Irons takes in all the advantages they offer to the senior players out there. Great swinging speed: Made out of graphite, these irons are the best way to improve the speed of your swing. Since the irons are way lighter with this design, they can be swung faster and retain the same potential to transfer power to your balls when you connect with them. Perfect fit for seniors: One of the many perks of these clubs is that they are a good fit for seniors even when bought at the regular flex level. You don’t need specialized flex to use them on the course of your choice. More accurate shots: Using this set of eight clubs allows your shots to travel further and straighter than ever before. Regardless of the part of the head your shots connect with, you’ll manage to send the ball to the place you want it to go. This allows seniors to reduce handicaps and play better games overall. A little longer than normal: If you are used to normal golf clubs, you may have a problem adjusting to these. They are longer than you might expect them to be. They will also not be a great fit if you’re short. Overall, the Adams Blue Combo Irons﻿﻿ set is one of the best a senior can get. It does have a disadvantage if you’re a shorter person, but more than makes up for this with the many benefits they bring to the table. Take up the Blue Combo irons today and watch as your game improves exponentially. Tour Edge is another company we have come to respect for the quality of their golf club sets. With 17 pieces in the set, this is one of the largest and best for any purpose at all. Larger sweet spot: The irons all have a much larger sweet spot than normal, which leads to more connecting shots that fly accurately. You don’t have to worry about your balls going awry just because you didn’t aim the shot right. Most shots travel straight down in the line you wanted them to go. Versatile set: If you’re looking for a set to complete your golfing experience, this is the one for you. 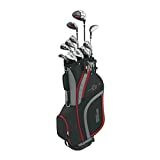 This set allows you to use clubs for any purpose including driving, fairway shots, putting, and more. Each of the clubs is designed to be assistive with your game and to add to the experience. Hybrids included: There aren’t many sets out there that round out their clubs with a hybrid iron, but this one does. It offers the best in class performance for shots regardless of the situation in which you apply it. All clubs are made of graphite too, which allows for faster, more powerful shots. Not enough hybrids: This is the only disadvantage with the set—there aren’t enough hybrids to go around. A couple more would be very nice to see. The Tour ﻿﻿Edge se﻿﻿t is one of the largest and most versatile we have reviewed. If you are a senior with problems hitting your shots true, this is the set for you. Take the time to enjoy each of the clubs and their stellar performance. Featuring a unique design and great performance, the hybrid set from P﻿inemeadow is one of those that is made for the history books. We had the time of our lives reviewing this set, because of the many awesome features and the ton of fun we had during play. Forgiving shots: The design of this set is all about shot forgiveness. If you have trouble connecting your shots and accurately sending them down the range, worry no more. The larger sweet spot allows you to send your shots with striking precision wherever they connect with the ball. Improved control: The smaller heads of the shorter irons are made for more control. The shape and the size of the heads are designed for the sole purpose of sending shots exactly where you want them to go. Club heads are a little heavy: The heads are heavier and make the clubs harder to swing. The Pinemeadow Golf set is one of the better ones for seniors that we have reviewed. Check out the many hybrids in the set and watch as your game improves over time. Take the time to work with each of the clubs in the set and use them to your advantage. There are five choices here and many more in the market. We suggest you pick between the top two on this list: The Tour Edge set and the Wilson XLS.